This .820 Tee has a female hose threaded swivel end with a flow control valve so you can control water flow to each individual line. Use a male end to connect to the female side giving you flexibily to take your sytem apart in the winter if you choose. 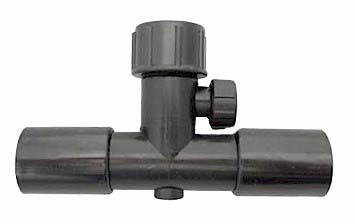 Use .700 Tees to branch off and create lateral lines with your .820 poly tubing (.820" OD), and or .820 soaker hose.